La Trobe University research has revealed a tobacco plant’s natural defense mechanisms could be harnessed to kill cancer cells in the human body. The research is still in its initial stages, and has a long way to go before it can even be regarded as a viable anti-cancer possibility, but there are some promising results. 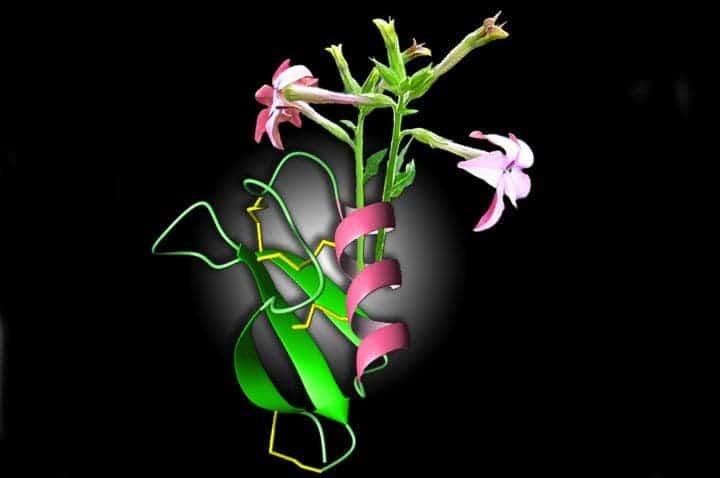 Scientists at the La Trobe Institute for Molecular Science have identified some remarkable properties of the tobacco plant. Apparently, a molecule in the flower of the plant not only fends off fungi and bacteria, but it also has the ability to identify and destroy cancer. But we for onto the ‘cure for cancer’ hype train, let’s look at this objectively. What the researchers have shown is that this peptide works against cancer cells in a Petri dish, in vitro – many, many things work well against cancer in vitro. They’re still a long way from even testing this as a viable possibility – they have to first see how it behaves in a living system, that is, initially testing it in healthy animals (most likely mice). See how long it takes to get in the body through different routes, what concentration reaches the target, and so on – the so-called pharmacokinetics. You also have to look for side effects and potential health hazards. Then, you are ready to test it out in mice with implanted tumors – if it doesn’t work, it’s not a cancer treatment. If it works, there’s still a 90% chance it can’t be used in humans – but trials will go on, ultimately moving on to humans. That’s the long, almost excruciating route any potential treatment for cancer has to follow. It takes years, and even some promising ideas fail – but you have to start somewhere. This is not to take anything from the researchers – their study is indeed valuable, and it holds a lot of promise – either in itself, or in its underlying mechanism. This indeed, sounds very good. We’ll just have to wait and see.